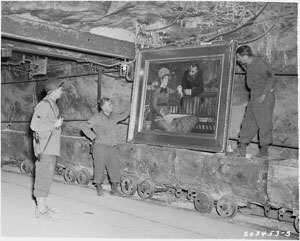 Manet's "Wintergarden" A painting by the french impressionist Edouard Manet, titled "Wintergarden", discovered in the vault at Merkers. 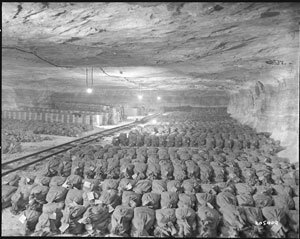 4/25/45. General Dwight D. Eisenhower, Supreme Allied Commander, and General Omar N. Bradley, CG, 12th Army Group, examine a suitcase of silverware, part of German loot stored in a salt mine at Merkers. 4/12/45. 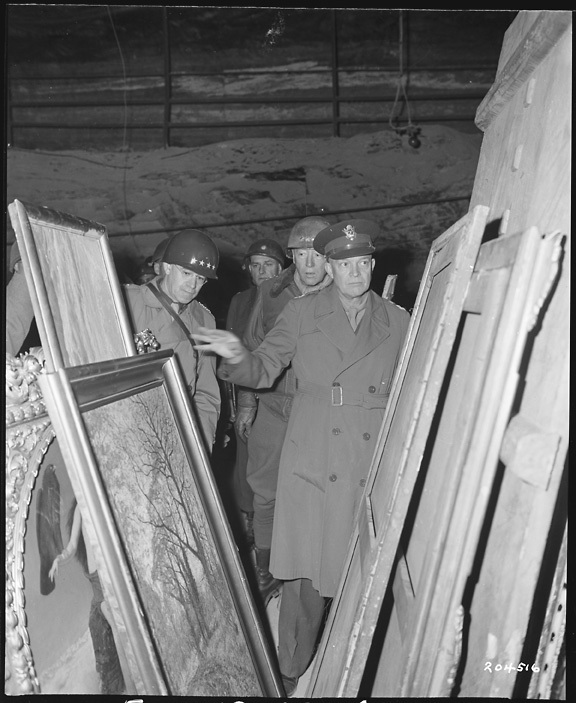 General Dwight D Eisenhower, Supreme Allied commander, inspects art treasures looted by the Germans and stored away in the Merkers salt mine. Behind GEN Eisenhower are General Omar N. Bradley (left), CG of the 12th Army Group, and (right) LT Gen George S. Patton, Jr, CG, 3rd U.S. Army. 4/12/45. 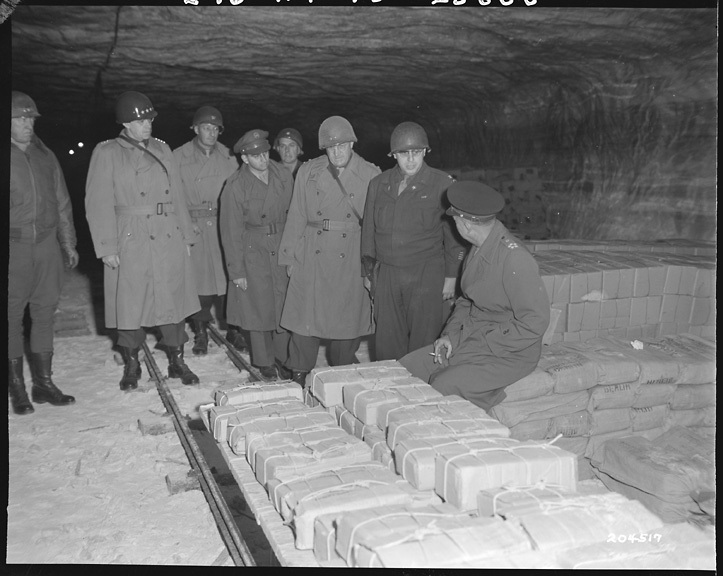 General Dwight D Eisenhower, Supreme Allied commander, accompanied by General Omar N. Bradley, CG of the 12th Army Group; MG Manton Eddy, CG, XII Corps, and COL Bernard Burnstern, tours German salt mines in which stolen treasure was hidden. 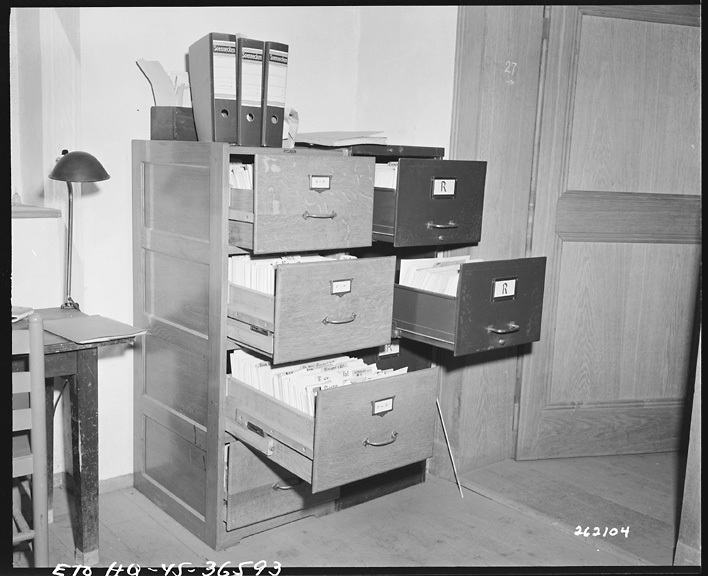 4/12/45. 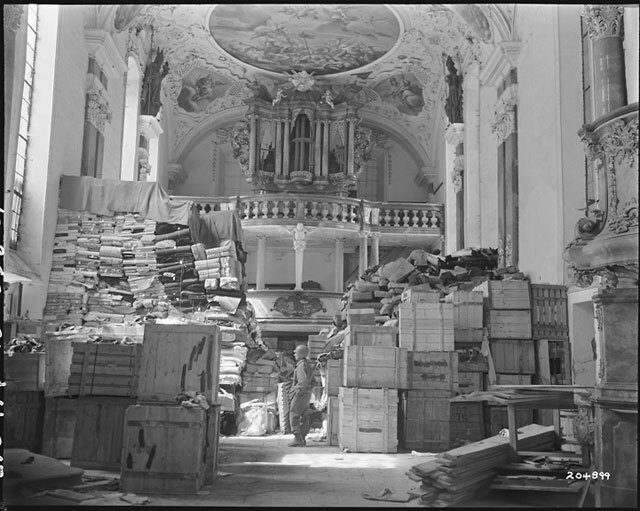 German loot stored in church at Ellingen, Germany found by troops of the U.S. Third Army. 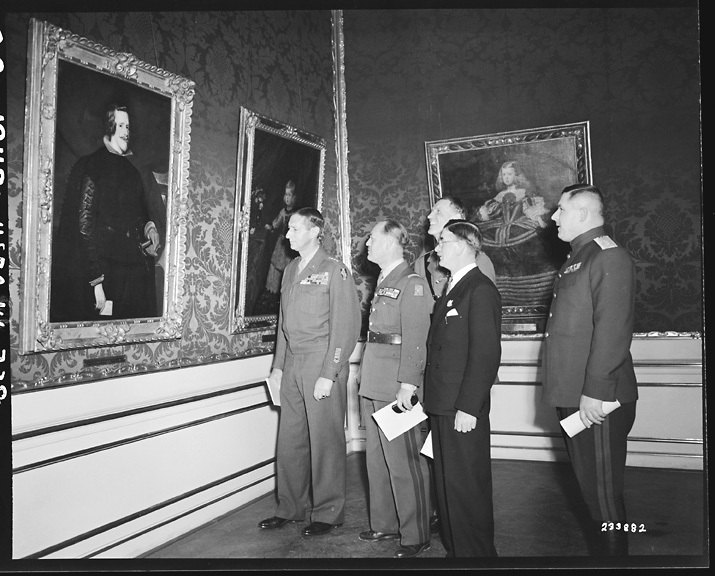 4/24/45. 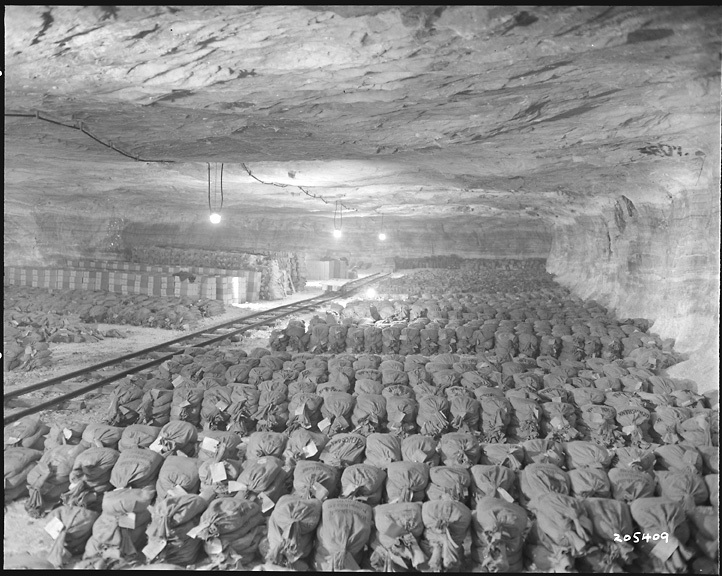 ReichsBank wealth, SS loot, and Berlin Museum paintings that were removed from Berlin to a salt mine vault located in Merkers, Germany. 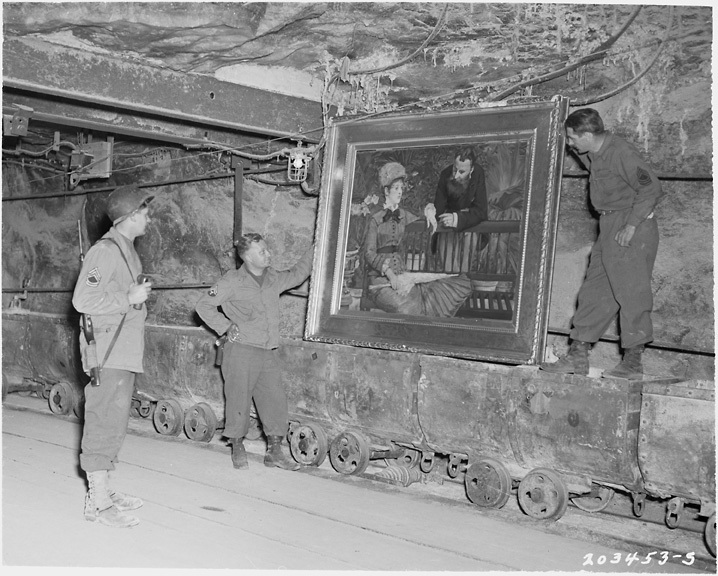 The 3rd U.S. Army discovered the gold and other treasure in April 1945. 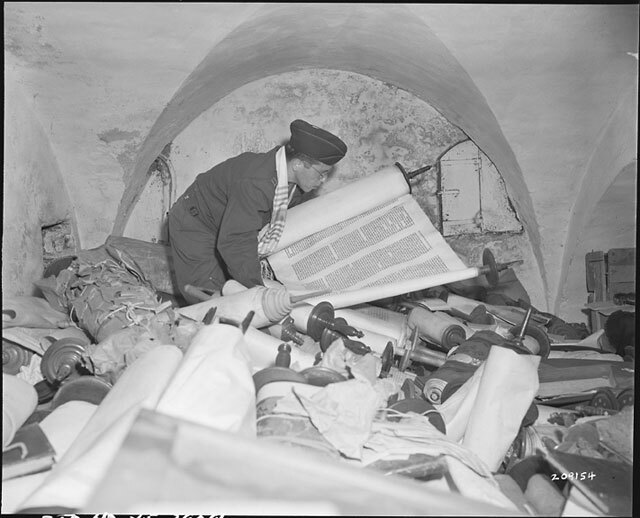 Chaplain Samuel Blinder examines one of the hundreds of "Saphor Torahs" (sacred scrolls) part of a cache of Hebrew and Jewish books that were stolen and collected from every occupied country in Europe. 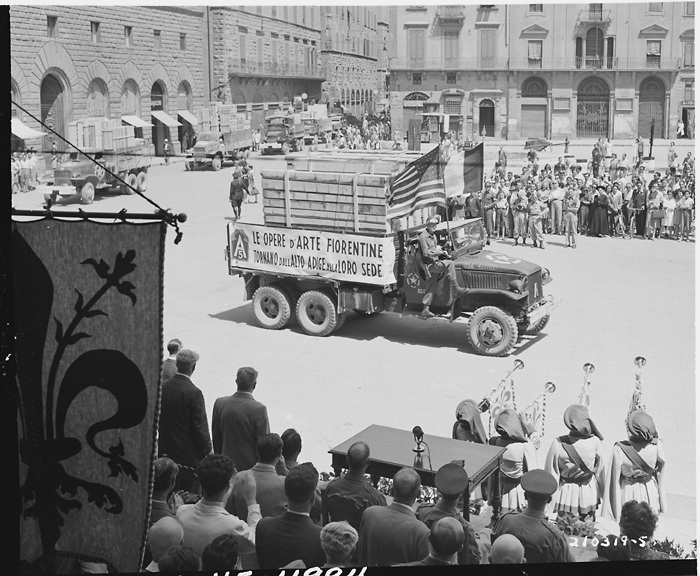 7/6/45. Six trucks with part of the half billion dollars worth of Florentine art treasure, which was taken to Bolsano by retreating Germans, arrives at Piazzo Dei Signoria, Florence, Italy and passes by reviewing stand of American, English and Italian officials. 7/21/45. One of the trucks that transported the art treasures to Florence, Italy. The paintings had been stolen by the German Army and recovered by the U.S. Army and returned to the city of Florence. 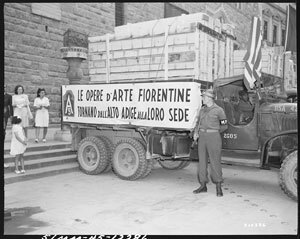 7/23/45. The Hungarian Royal Crown jewels have been in the custody of the Seventh U.S. Army along with the Hungarian guard. 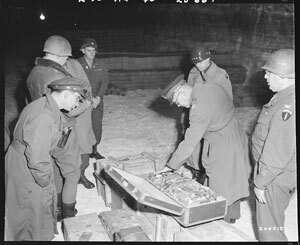 The jewels are going to the U.S. Army repository at Frankfort, Germany for safe keeping. 8/3/45. The Diego Velazquez Painting "Philip IV King of Spain", being examined byGEN Mark W. Clark, CG USFA, who was the host to allied leaders, and the Austrian people during a ceremony where art treasures recovered by the U.S.Army were returned to the rightful owners. 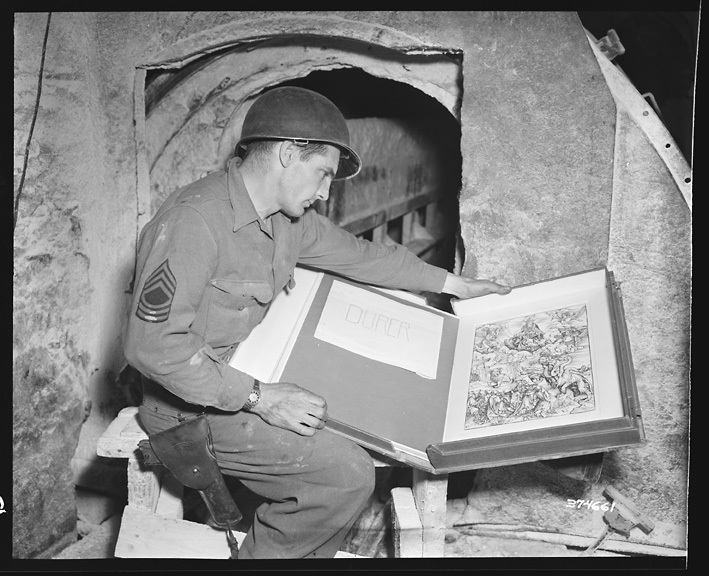 LT. GEN Emile Marie Bethourart of France, LT. GEN. R.L. McCreery of Britian, Mr. Figl, Chancellor of Austria, and COL. GEN. Alexis Zheltov, Russian Deputy Commander, were guests of GEN Clark. 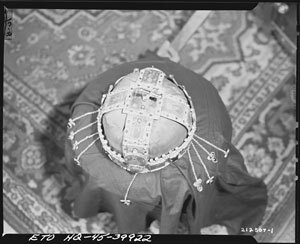 12/19/48. 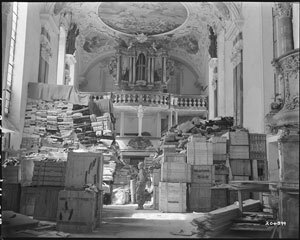 The Alfred Rosenberg (ERR) files in a room of the Neuschwanstein Castle. The largest Nazi art loot cache was found by units of the 7th U.S. Army when they explored tunnels under the castle. 5/13/45. M. SGT Harold Maus of Scranton, PA is pictured with the Durer engraving, found among other art treasures at Merker. 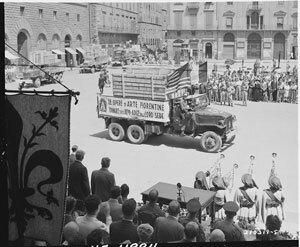 5/13/45. An unknown Rembrant recovered safe in Munich. 5/13/45. 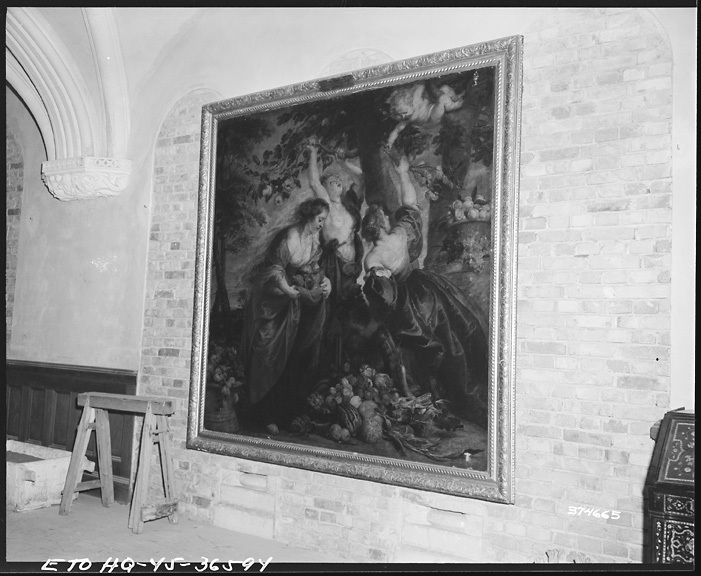 A Rubens painting "The Graces in the Gardens of the Hesperides" taken by the Einsatzstab Reichsleiter Rosenberg (ERR). 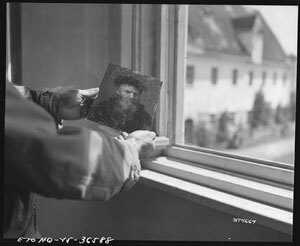 5/13/45.